The short period variability of the duration of the occurrence of stable snow cover and the concentration of marine ice is revealed and compared for Northern Eurasia and the adjacent area of the Arctic Ocean against a background of multiannual variations in indices of atmospheric correlation in 2000–2015. The main principles of multiannual variations in the characteristics are determined. No correlation between the multiannual tendencies and interannual variability is found. Nonetheless, the calculation of the Fourier harmonics allowed identification of three five-year periods similar for all characteristics: 2000–2004, 2005–2009, and 2010–2014. 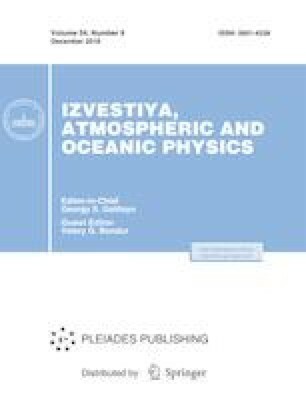 The most intense variations of the duration of the occurrence of stable snow cover and concentration of marine ice from one five-year period to another are typical of the East European Platform in contrast to the noticeable but small variations for Siberia. This work was supported by a program of Fundamental Scientific Research of the Russian Academy of Sciences (project no. 01482014-0015) (T.B. Titkova) and the Russian Foundation for Basic Research (project no. 16-05-00753) (L.M. Kitaev).